About: Newly refurbished Samuel Smith's Pub, with dart board downstairs and food served in the upstairs lounge bar. Bad bad bad. They gave me a flat white wine spritzer in a half pint glass that really tasted bad. It felt like really cheap wine that had been opened for a long time with very flat soda and when I told the manager (who then refused to give me his name) he was very rude and told me he wasn’t going to make me a new drink and that if I wanted a different one I had to pay for it. So much for courtesy and customer service! Never going back there and so shouldn’t everyone else! 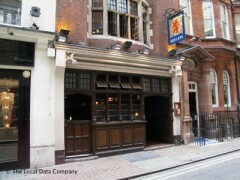 was served by the rudest bartender in London (imagine the disaster, considering the number of bad bartenders in town). He could not be bothered to tell us what beers they have, could not be bothered to answer any questions, all he wanted was our money. Went for drinks, had only one then went to another bar nearby to have more drinks. Last time you get my custom and my money. Farewell rude pub! AVOID THIS PUB AT THE MOMENT! At least until the very unpleasant couple who are currently run it are sacked or leave. They are very rude to customers and the atmosphere of a once nice pub has sadly gone for the time being. I am sure they won't last long.